sources are not necessarily the same. The cascade H-bridge consists of two cells, high-voltage cell and low-voltage cell. The high-voltage cell is responsible for voltage lifting, while the low-voltage cell is responsible for PWM modulation. maintain the capacitor’s voltage at a reference level. Independent DC source can effectively ensure the DC voltage. use of high power motor brings up a lot of reactive power. coal face. It becomes obvious especially on-peak demand. voltage thyristor-based devices, such as IGCT, is limited. bring each own advantages to the circuit. (DTC) scheme for electric vehicles (EVs) or hybrid EVs. YJ03) Supported by：National Natural Science Foundation of China. 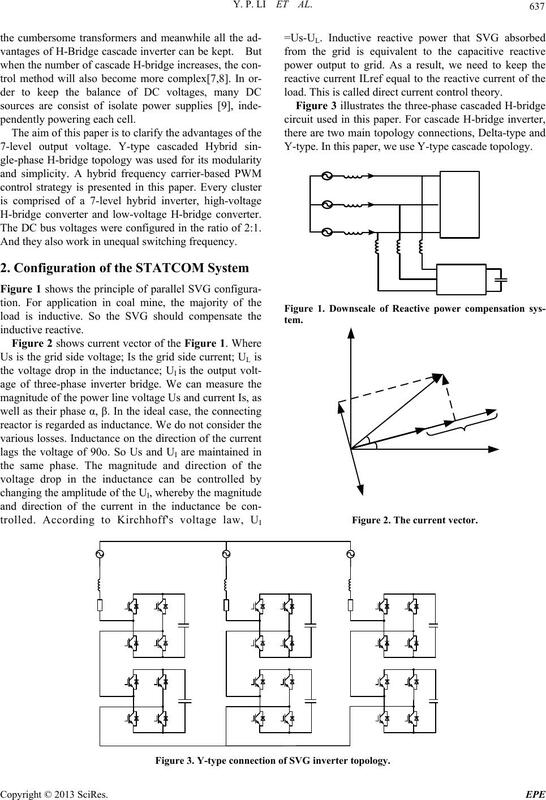 H-bridge converter and low-voltage H-bridge converter. The DC bus voltages were configured in the ratio of 2:1. And they also work in unequal switching frequency. load. This is called direct current control theory. Y-type. In this paper, we use Y-type cascade topology. Figure 2. The current vector. Figure 3. Y-type connection of SVG inverter topology. 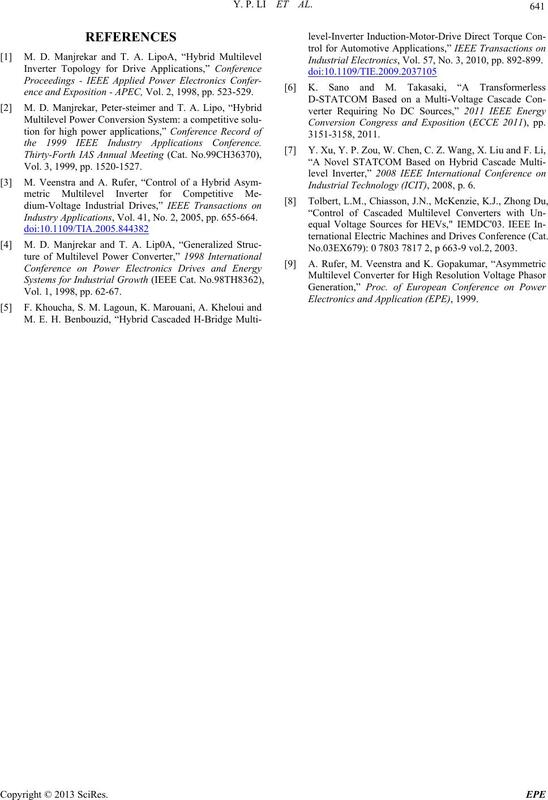 Y. P. LI ET AL. The three-phase inverter is composed of three Clusters. strategies of each cell are individually shown in Table 1. Figure 4. Square wavefor m of Cell1 and PWM wave for m of Cell 2. Figure 5. 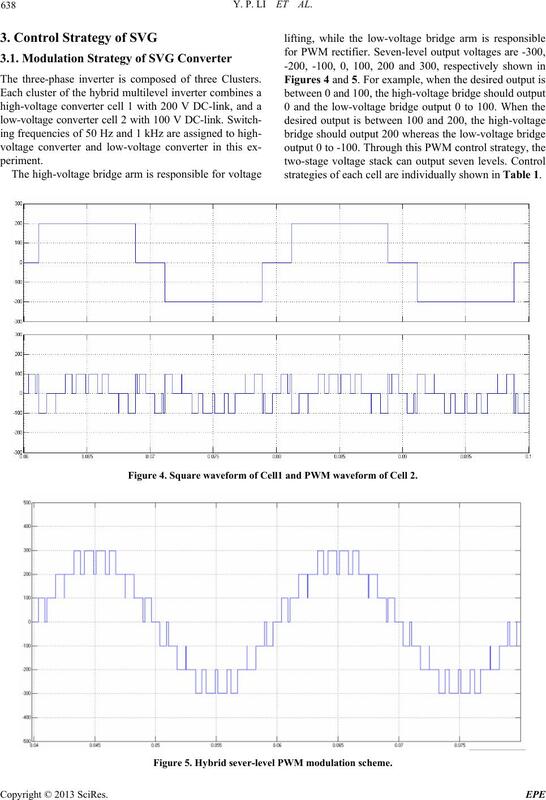 Hybr id sever-level PWM modulation sc he me. β.This is called Clarke transformation. Ibl and Icl are the three-phase current of the inductance. active current of the grid can be tracked and compensated. inverter, which are Uaref , Ubref and Ucref. Figure 6. 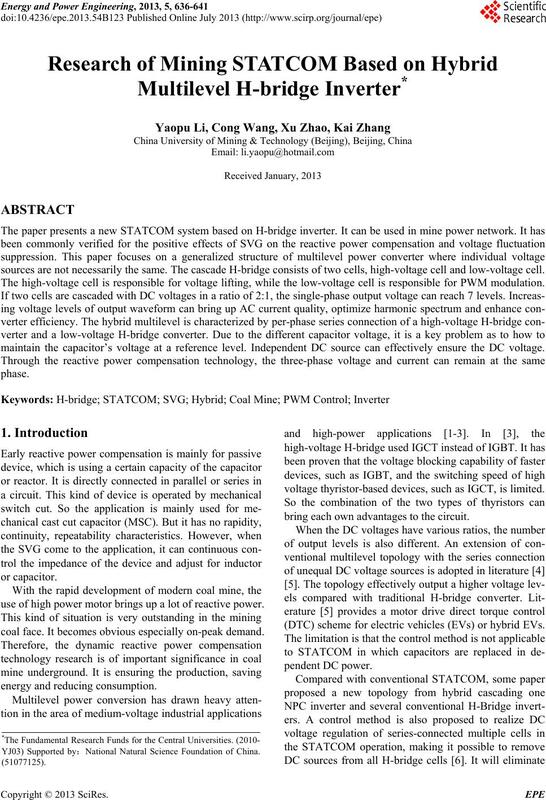 The strategy of reactive power detection. Figure 7. Phase comparison of voltage and current after compensation. Figure 8. 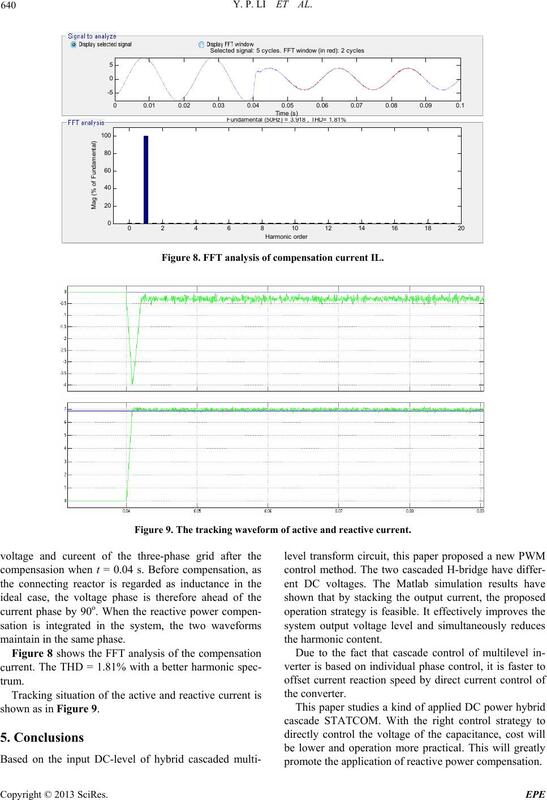 FFT analysis of compensation current IL. Figure 9. The tracking waveform of active and reactive current. maintain in the same phase. 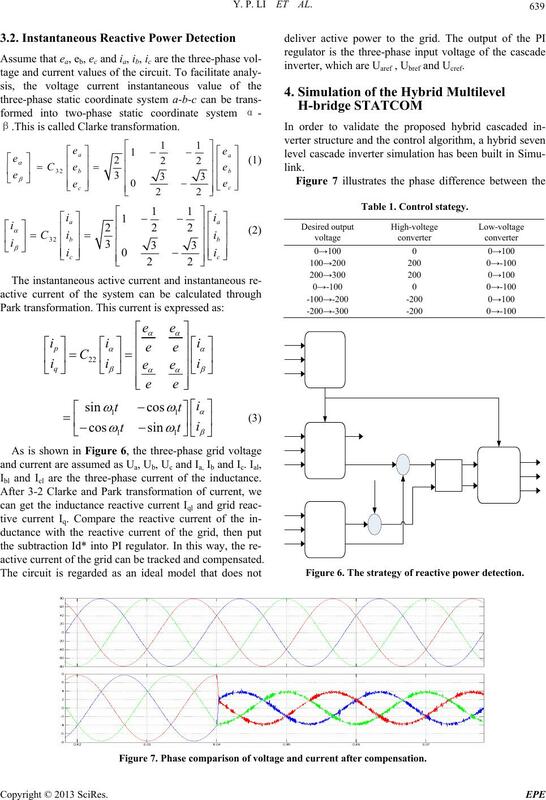 own as in Figure 9.
promote the application of reactive power compensation. ence and Expo98, pp. 523-529.
, No. 2, 2005, pp. 655-664.
the 1999 IEEE Industry Applications Conference. Vol. 3, 1999, pp. 1520-1527. Vol. 1, 1998, pp. 62-67. Industrial Electronics, Vol. 57, No. 3, 2010, pp. 892-899. Conversion Congress and Exposition (ECCE 2011), pp. Industrial Technology (ICIT), 2008, p. 6.
ternational Electric Machines and Drives Conference (Cat. No.03EX679): 0 7803 7817 2, p 663-9 vol.2, 2003. Electronics and Application (EPE), 1999.